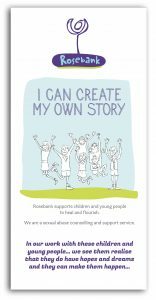 Rosebank is a free and confidential counselling service for children and young people in Liverpool, Fairfield and Campbelltown who have experienced sexual abuse. We also counsel non-offending family members. We do not see anyone who has been accused of abuse. We are one of the oldest child sexual assault support services in Australia, and we are committed to helping children, young people, and families overcome the effects of trauma. All of our counsellors have Post Graduate level specialist sexual assault training, and receive ongoing professional development and training in trauma and therapy models. We have experience in social welfare, education, social work, counselling, working with children and families, disability, out of home care and women’s health. We use our decades of knowledge and experience to make the best program for every individual to deal with trauma in a productive way. We are advocates of early intervention so that children and young people can start writing their own story as soon as possible. Rosebank is a creative and non-judgmental space. We use a variety of therapeutic modalities to suit the needs of each child or young person. To find out more about how we work, have a look at Our Services, or read our FAQs or download our brochure here. We are proud of our staff, their expertise and the diversity of their experience. We are linked by our belief in the power of our work to change futures. HELEN has a Degree In Social Welfare from the University of Western Sydney and completed a variety of specialist training provided by NSW Health for Sexual Assault Counsellors. Helen is a counsellor as well as the Service Coordinator. She has worked with children and families for 30 years and 9 of those have been at Rosebank. She has also worked in out of home care working with foster carers and those families who are experiencing difficult times. Helen has also worked in disabilities supporting families , arranging mini breaks when needed for their children. Helen has also been a family support worker with Supported Playgroups helping parents to form stronger bonds with their children and allowing children to let their imaginations run wild through the means of fantasy and play. Helen is passionate about working with children young people and families to increase hope and opportunities in their lives so they can grow and flourish. MELISSA has completed a Masters in Psychotherapy and Counselling from Western Sydney University. The completion of a placement at Sexual Assault Service – Rosemeadow, working with clients of all ages who had been impacted by the trauma of sexual assault, led to becoming a counsellor at Rosebank. Melissa is passionate about the power of play to transform, heal and to empower an individual to be able to move forward with their life. Melissa has a diverse background, she has worked as a librarian for many years. Melissa also worked as a telephone counsellor for the Australian Breastfeeding Association national helpline providing counselling on parenting and breastfeeding issues. She has also taught Ethics in a local primary school working with children of diverse ages and cultural backgrounds. NICOLE has a Bachelor of Arts – Psychology and is attaining a Masters in Psychotherapy and Counselling. She is a co-facilitator for kids space art therapy group, where she is supporting children who have experienced trauma. Nicole believes in creating a safe space where children and adults can find the words to tell their story, and through this find empowerment, strength and hope for the future they wish to build. AMANDA specialises in Sandtray therapy and uses this and other creative methods to help children and young people express themselves and tell their story. Amanda has a Degree in Social Work and Diploma in Welfare Work. She is experienced in working in Child protection, Out of home care and counselling families who have experienced trauma. Amanda enjoys helping individuals and families identify their inner strengths, resilience and resources to challenge barriers, build stronger relationships and increase self confidence. RUTH has a Bachelor of Education in Special Needs and Art and a Graduate Diploma of Counselling. She was a teacher in London UK before coming to Sydney and working for a relationship counselling service and then a mental health recovery project. Ruth has many years experience of group work, both in schools and the community. She believes that safe creative groups enable adults and children communicate about the impacts of violence and abuse, build a stronger sense of self and reduce isolation. She has been facilitating the Girlspace Project and the Tree of Life Scrapbooking Group since 2010, and is passionate about working in partnership with other services to build safer more connected communities. and the care to get it right for every person.